Don't leave users high and dry with a generic "Page cannot be displayed" message. Let 404Bucks replace error pages with relevant ads that help visitors find what they're looking for. Error pages are a big turn off to your audience. 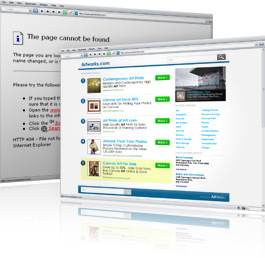 Engage users, and get your products and services in front of them by displaying your ads on 404 Pages. Reach more users by ensuring that your ads appear on as many pages as possible. There are millions of broken links scattered across the web. Why not let advertisements breathe life into them? Instead of seeing a bland and unattractive error message, users will encounter your ads, which generate exposure for your products and services. Here at 404Bucks, we make sure that you don't blow your budget on low-quality clicks. Our algorithms take a website's theme and targeted keywords into consideration to guarantee that your ads reach interested users. Sign up for AdMedia's 404Bucks watch your conversion rates soar!